A permanent resident and migrant; a very abundant species during the Minnesota Breeding Bird Atlas (MNBBA). Broadly distributed across Canada, from eastern British Columbia and the southern region of the Northwest Territories, east to southern Quebec and the Maritime Provinces. In the United States, the American Crow ranges from the Pacific Northwest and the coast of California east to the Atlantic coast. It is absent from large regions of the arid Southwest. An abundant species throughout much of its breeding range; some of the highest breeding densities are observed in the southeastern United States and portions of the Great Lakes region (Figure 1). Assigned a Continental Concern Score of 7/20 by Partners in Flight. The American Crow is a legally hunted species in Minnesota. Short-distance migrant to year-round resident. In Minnesota American Crows are considered a permanent resident in most regions of the state. They are less common in the winter months in northern counties, indicating that some birds move south. Recent fall counts of migrant American Crows at Hawk Ridge, Duluth, Minnesota, provide documentation of this southern movement in the northern states and Canada. An annual average of 11,226 birds were counted each fall from 2007 to 2011 (Bardon 2012). Omnivorous ground forager; can be an economic pest when large roosts are located near agricultural crops. A large, bulky bowl constructed primarily of dead twigs; usually placed high with in a tree. Breeding distribution and relative abundance of the American Crow in North America based on the federal Breeding Bird Survey, 2011–2015 (Sauer et al. 2017). Man’s crops and animal waste are much to its liking, and the destruction of Hawks, Owls, the Raven, and predatory fur-bearing mammals has given it an immunity from danger and an easy, carefree life such as it did not know under old conditions. Thus, man, himself, is largely responsible, both unavoidably and avoidably for the enormous increase in the Crow population of our country which has taken place during the last half-century. Although the American Crow is largely considered to be a year-round, permanent resident, Roberts observed that its numbers diminished during the winter months in southern Minnesota and that it was “less frequent” farther north. At the time, confirmed nesting reports (nests with eggs or young) were available from 8 counties scattered across southern, central, and northern Minnesota: Aitkin, Hennepin (Minneapolis), Isanti, Kittson, Lincoln, Polk, Sherburne, and Stearns. An inferred nesting report (nest only) was available from Goodhue County. In the years that followed, little changed regarding the American Crow’s abundance and distribution. It has remained a common breeding resident throughout the state (Green and Janssen 1975; Janssen 1987). Janssen (1987) identified 26 counties where breeding had been confirmed since 1970; Hertzel and Janssen (1998) added 8 more counties to the list. Janssen (1987) remarked that it was unknown whether winter flocks of crows were comprised of local residents or northern migrants. The Minnesota Biological Survey identified 2,599 breeding season locations in all corners of the state, with the exception of the most intensively cultivated regions in the Red River valley and the upper Minnesota River valley (Minnesota Department of Natural Resources 2017). During the MNBBA, observers reported 7,275 American Crow records in 73.0% (3,570/4,889) of the surveyed atlas blocks and in 88.2% (2,061/2,337) of the priority blocks. Breeding was confirmed in 728 atlas blocks (Figures 2 and 3; Table 1). The crow was the sixth most commonly reported species during the MNBBA. Observations were reported in all 87 counties, and breeding was confirmed in 78 counties. Seven of the 9 counties where breeding was not confirmed were in the far western regions of the state; 2 were in south-central and southeastern Minnesota. Breeding was most frequently confirmed in major metropolitan areas, including the Twin Cities, St. Cloud, Brainerd, Rochester, and Duluth. Abundant statewide, the species was relatively less abundant only in far north-central Minnesota, where large peatlands dominate the landscape. Assessing the status of local American Crow populations can be complex. During the breeding season, males may leave their territory and spend the night at communal roosts. Then, once the young have fledged, the entire family may spend the night in communal roosts and return to their territory to feed during the day. There is considerable variation, however, in how individual birds and family groups behave from day to day (Verbeek and Caffrey 2002). Such behavior makes it difficult to accurately model its predicted distribution and to accurately assess population numbers. In Minnesota, the nonbreeding season movements of breeding residents have not been examined. In states where banding studies have tracked individual birds, winter roosts are known to be comprised of both year-round residents and migrants. This is likely the case in Minnesota as well. The pulse of migrants that move through the state each spring and fall, traveling to and from their breeding grounds farther north in Canada, is well documented (Minnesota Ornithologists’ Union 2016). Migratory movements are apparently most extensive in Great Plains populations (Bent 1946). Although their breeding distribution in Minnesota remains similar to that described by Roberts nearly 100 years ago, crows are certainly more common in northern Minnesota during the winter months than they were decades ago. Now it is not uncommon for crows to be reported throughout northeastern and north-central Minnesota from December through February. Landfills and feedlots, even when the ground is covered in snow, provide a reliable food source throughout the coldest winter months. As average winter temperatures continue to rise, this ground forager also finds more opportunities to forage in natural habitats. In addition to extending its winter distribution in Minnesota, the American Crow expanded north into Canada during the 20th century, following settlement and the suppression of prairie fires. It was a rare inhabitant in cities and towns until the latter half of the 1900s, but tree plantings and the prohibition of hunting in residential areas facilitated its expansion. Considered uncommon throughout much of the northeastern United States in the late 1800s and early 1900s, it now is an abundant and widespread species throughout that region as well. The species’ adaptation to human-modified environments certainly has aided its population growth and range expansion throughout North America (Verbeek and Caffrey 2002). Breeding distribution of the American Crow in Minnesota based on the Breeding Bird Atlas (2009 – 2013). Summary statistics of observations by breeding status category for the American Crow in Minnesota based on all blocks (each 5 km x 5 km) surveyed during the Breeding Bird Atlas (2009-2013). Summary statistics for the American Crow observations by breeding status category for all blocks and priority blocks (each 5 km x 5 km) surveyed during the Minnesota Breeding Bird Atlas (2009-2013). Extremely adaptable, the American Crow is found in a wide range of both natural and modified habitats, including woodlots, forest edges, riparian areas, city parks, cemeteries, and farmsteads (Figure 4). The only habitat totally avoided is deserts. Suitable habitat needs to meet only two broad requirements: open areas for foraging on the ground, and scattered trees for nesting, roosting, and resting (Verbeek and Caffrey 2002). Although crows tend to avoid extensively forested landscapes, they may be found in riparian areas along rivers and streams and in open areas, such as small settlements, campgrounds, and forest openings. An extensive, long-term study of bird communities on the four national forests in northern Wisconsin and Minnesota found crows were most abundant in local towns and in habitats associated with water (Niemi et al. 2016). Data collected at the MNBBA point counts illustrate the species’ ability to find virtually all habitats suitable to some degree (Figure 5). Typical breeding habitat of the American Crow in Minnesota (© Lee A. Pfannmuller). Habitat profile for the American Crow based on habitats within 200 m of point counts where the species was present during the Minnesota Breeding Bird Atlas (2009-2013). Using data gathered by the federal Breeding Bird Survey, biologists have estimated the North American population of American Crows is 27 million breeding adults (Rosenberg et al. 2016). In 2013, Minnesota was estimated to support 2.6% of the continental population, or 710,000 birds (Partners in Flight Science Committee 2013). The crow’s complex behavior during the breeding season did not lend itself to generating a reliable population estimate using MNBBA data. The Partners in Flight estimate seems low, however, given the species’ statewide abundance. The American Crow is abundant throughout most of its breeding range; the average number of birds observed per BBS route in Minnesota each year is 35. Some of the highest BBS numbers in the United States are observed in the Southeast, including an average of 80 per route in Virginia, 68 per route in Maryland, and 67 per route in Georgia (Sauer et al. 2017). Population density estimates vary widely depending on localities. In upstate New York, where intensive, long-term studies of local crow populations were conducted for years, McGowan (2001) reported 11.5 territories per km2 in towns, and 2.6 territories per km2 in rural areas. In northern Minnesota, Niemi and his colleagues (2016) reported a mean of 32.9 detections per 100-10 minute, unlimited radius points counts on the Chippewa National Forest compared to a mean of only 11.4 detections on the Superior National Forest. On the Chippewa National Forest, crows were among the 20 most common species in 12 of the 17 cover types sampled; the average number of detections per 10 minute point count ranged from 1.9 in midsuccessional aspen-birch stands to 5.2 detections in mature upland hardwoods. On the Superior National Forest, crows were among the 20 most common species in just 3 of the 21 cover types sampled; the average number of detections per 10 minute point count ranged from 1.6 in mature white pine stands to 7.6 in mature oak stands (Niemi et al. 2016). The higher density of small towns in the landscape surrounding the Chippewa National Forest coupled with a more deciduous and fragmented landscape than that found on the Superior National Forest likely contributed to their higher abundance and wider distribution. Since the BBS began in 1966, data have demonstrated a slowly increasing population of American Crows across southern Canada and the United States until the year 2000, when numbers were significantly impacted by the outbreak of the West Nile Virus (WNV) in 1999. Transmission rates were so high in the eastern United States that some local populations declined by nearly 70% (Reed et al. 2009). Since about 2005, numbers have begun a slow recovery. Farther west, in Minnesota, the decline was not nearly as severe. Nonetheless, thousands of dead crows were reported to the Minnesota Department of Health (2004) during the peak of the outbreak. Since 1967, the statewide population has been relatively stable (Figure 6). A decade after WNV was first introduced to the United States, researchers discovered that the virus declined in virulence as it moved west (Koenig et al. 2010). 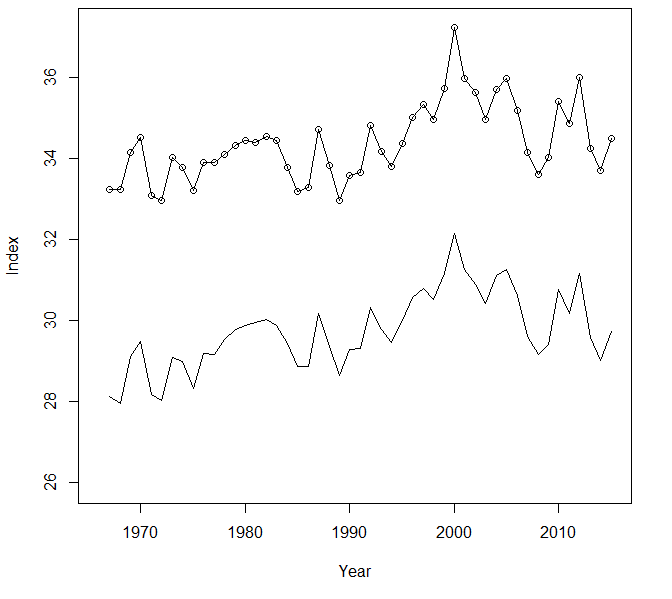 Breeding population trend for the American Crow in Minnesota for 1967–2015 based on the federal Breeding Bird Survey (Sauer et al. 2017). Long the target of human persecution, the “cunning and intelligent” American Crow has survived and prospered despite many a focused effort to reduce local populations (Bent 1946). Efforts have been most intense at winter roost sites, where the birds can congregate in numbers ranging from just a few hundred birds to more than 500,000 and larger (Gorenzel and Salmon 1992). The largest roosts are located in areas where food is abundant, often resulting in local crop depredation. In urban areas large roosts can cause concerns regarding noise, defecation, and overall disturbance. But local efforts to reduce damage are largely unsuccessful. In Minnesota, Carlos Avery, game and fish commissioner in 1922, reported on the “enormous kill” by sportsmen’s clubs that not only did not reduce local crow populations but often resulted in the loss of “an immense number of useful Hawks, Owls and other large birds” (Roberts 1932). In Oklahoma, from 1934 to 1945, a total of 127 roosts were dynamited, resulting in the loss of more than 3.8 million birds. Despite the carnage, there was no noticeable reduction in the damage to agricultural crops (Hanson 1946). Such practices are largely of a bygone era. When local control is needed, efforts now initially focus on techniques to exclude or frighten the birds before lethal control efforts are implemented. In addition, since 1989, it has been legal to hunt crows in Minnesota, during a spring and fall harvest season. In the past 10 hunting seasons, the number of crow hunters in Minnesota has ranged from a low of 7,400 (2014–2015) to a high of 11,480 (2012–2013). During the same time period, the estimated statewide harvest has ranged from 52,200 birds (2008–2009) to 90,700 birds (2012–2013) (Dexter 2016). Needless to say, with an abundant, widespread population that has prospered with the increase in human populations, the American Crow has a low conservation score of 7/20 and is poised to remain an abundant member of the state’s avifauna for many years to come (Rosenberg et al. 2016). Even warming temperatures are not likely to have a negative impact on this adaptable species (North American Bird Conservation Initiative 2010). Bardon, Karl J. 2012. “Fall Diurnal Migration of Passerines and Other Non-raptors at Hawk Ridge and Lake Superior, Duluth (2007–2011).” Loon 84: 8–20. Bent, Arthur Cleveland. 1946. Life Histories of North American Jays, Crows, and Titmice: Order Passeriformes. Smithsonian Institution Bulletin 191. Washington, DC: U.S. National Museum. Gorenzel, W. Paul, and Terrell P. Salmon. 1992. “Urban Crow Roosts in California.” In Proceedings of the Fifteenth Vertebrate Pest Conference 1992, edited by John E. Borrecco and Rex. E. Marsh, 97–102. Davis: University of California, Davis. Hanson, H. G. 1946. “Crow Center of the United States.” Oklahoma Game and Fish News 2: 4–7. Koenig, Walter D., Wesley M. Hochachka, Benjamin Zuckerberg, and Janis L. Dickinson. 2010. “Ecological Determinants of American Crow Mortality Due to West Nile Virus During its North American Sweep.” Oecologia 163: 903–909. McGowan, Kevin J. 2001. “Demographic and Behavioral Comparisons of Suburban and Rural American Crows.” In Avian Ecology and Conservation in an Urbanizing World, edited by John M. Marzluff, Reed Bowman, and Roarke Donnelly, 365–381. Norwell, MA: Kluwer Academic Press. Reed, Lisa M., Michael A. Johansson, Nicholas Panella, Robert McLean, Terry Creekmore, Rose Puelle, and Nicholas Komar. 2009. “Declining Mortality in American Crow (Corvus brachyrhynchos) Following Natural West Nile Virus Infection.” Avian Diseases 53: 458–461.